What are the places I am wanting to see while I am in Busan? What activities do I intend on doing? How long do I plan on staying in Busan? Based on these answers you should be able to narrow it down to 1 or 2 areas. Others on the other hand my not necessarily know exactly what they want to do or see (if this is the case check out My Top 10 Places in Busan to help you on your way) and are just looking for the most convenient place to visit the main attractions while in Busan. Let me give you some insight into the questions above. First Question, if you plan on visiting places that are all in the same area (Eg Haeundae, Gwangalli, Centum City) then you obviously should be looking to stay someone close to those rather than book a place that is centrally located to other attractions you don’t intend on visiting. Second Question, this one is important as if you intend on doing a lot of shopping, you may want to stay closer to Centum City (Shinsegae Dept Store) or Seomyeon as those have some of the best shopping areas in Busan. If you are planning on going out most nights, then I would recommend either staying close to Seomyeon, Gwangalli or the Kyungsung University Area. Wanting to visit mostly attractions, temples and other important locations? then I would pick an area that is centrally located and has convenient transport. Wanting a mix of everything? Then Seomyeon or Gwangalli Beach would be a decent choice here. And lastly the Third Question, if you intend on spending only 1 or 2 nights here then you may choose to stay in an area of which you can do a mixture of everything as this eliminates you having to catch transport to another area to enjoy your days/nights. Also, if you were planning on spending 4 or 5 nights here, you may be OK with staying in an area which is a little further out from the city like Haeundae Beach as you won’t be rushed to see everything in a short amount of time. Haeundae beach contains a large number of restaurants, cafes, small stalls and bars to keep you entertained while you are there. It is also only 3 stops by subway to one of the largest Department Stores in the world, that being Centum City (Shinsegae). It is also only 6 stops by subway to Gwangalli Beach which in my opinion is the better of the two beaches. Dalmaji which is essentially a famous street lined with numerous amounts of coffee shops is also located in the Haeundae Beach area which is another plus if you do decide to stay here. 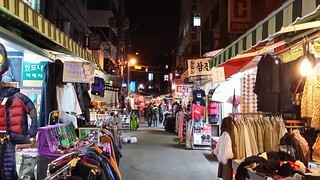 Another popular area for shopping, eating and entertainment is the Kyungsung University Area which is 9 stops by subway which although not far is not exactly close as such. The disadvantage of staying in this area is that Haeundae Beach is located towards the end of subway Line 2 in which only a few other areas are classified as “close”, being Gwangalli Beach, Shinsegae Dept Store and Kyungsung University (sort of). The other main areas require a decent subway ride or taxi ride to go and return. Loads of restaurants, cafes, stalls & bars. Haeundae Beach only a minutes walk away. Close to Gwangalli Beach and Shinsegae Dept Store. Dongbaek Island is extremely close. Far from other main areas. Located at the end of subway Line 2. My thoughts: Haeundae Beach is a great place to stay in Busan as there are plenty of restaurants, cafes and you have the beach within walking distance. I would recommend it if you only have a short amount of time (1 or 2 nights) and you are intent on spending a night out there. If you want to try to see a variety of different places within Busan, I would recommend Seomyeon as it is more centrally located. Need help deciding where to stay in Haeundae Beach? Below is a list of accommodation which I believe is best suited for all kind of travelers. In my opinion, Seomyeon is probably my #1 choice in terms of where to stay in Busan. There are many advantages of staying here and the main one being the location. Seomyeon station connects subway Line 1 and Line 2, meaning you can ride the subway to the following places without changing trains: Nampo-dong, Jagalchi, PNU (Busan University Area), Kyungsung University Area, Gwangalli Beach, Shinsegae Dept Store, Haeundae Beach and Dongnae. Not only that but Seomyeon is arguably the busiest area at night in Busan as it contains a large number of restaurants, cafes, shopping (above and under ground) and bars. As Seomyeon is located on subway Line 1, those arriving via KTX or bus through Busan Station only have to travel 6 stops on the subway before arriving at Seomyeon Station. Another attraction within Busan that is accessible without changing trains is Beomeosa Temple which is located at the end of Line 1. Being centrally located, trips to various other sights will tend to be shorter which is great while you are travelling. Potentially one disadvantage is if you only plan on travelling to Busan for 1 night and you want to spend the night in Haeundae or Gwangalli Beach then I would obviously recommend staying at one of those locations. Loads of restaurants, cafes, shopping & bars. Centrally located to most of the main places in Busan. Able to travel to most of Busan’s attractions without changing subway lines. Great place to spend a night out eating, shopping and drinking. Located close to Busan Station which allows for easy arrival / departure. Both beaches (Gwangalli and Haeundae) require a minimum of 10 stops on the subway. My thoughts: There is a reason why Seomyeon is my #1 choice while staying in Busan and that is because of essentially 2 things. Location and Atmosphere. If I was travelling to a city, I would want to stay in a conveniently located area which is buzzing day and night. Seomyeon is that place. Need help deciding where to stay in Seomyeon? Below is a list of accommodation which I believe is best suited for all kind of travelers. This area is similar to the Haeundae area however two things are different. One being that it is closer to the other attractions than Haeundae and Two, I personally prefer visiting here over Haeundae. The reason being, at night the bridge is lit up, it is convenient to buy seafood and have a tent prepare and serve it to you, and the feel is generally better. Both Shinsegae Dept Store and Kyungsung University Area are only 3 stops away which is super convenient and Seomyeon is a little closer. Gwangalli Beach is a great place at night for all kinds of people, in such if you want to get a coffee and take in the glowing bridge there are more than enough coffee shops to keep you satisfied. If you want to eat Korean food, there are more than enough restaurants to satisfy you what ever you are looking for. Wanting to meet other like-minded travelers? Gwangalli is a great spot to meet expats and other people passing by. As great as Gwangalli is, if you don’t particularly enjoy views of the beach, or dislike seafood, I would probably advise somewhere like Kyungsung University Area, Seomyeon or even PNU (Busan University Area). If you are here for the shopping, I would even suggest staying close to Shinsegae Dept Store (Centum City) as there are endless amounts of shopping. Loads of restaurants, cafes & bars. Located close to Shinsegae Dept Store, Haeundae Beach and Kyungsung Uni Area. One of the best places in Busan for a night out eating and drinking. Gwangalli beach is within walking distance. If you are not that fond of the beach, there are better places to stay. My thoughts: Gwangalli Beach is one of my favourite places in Busan whether it be day or night. Obviously at night a lot comes to life including the famous Gwangan Bridge which is lit up purple making for a very nice view. Behind Seomyeon, I would probably suggest staying at Gwangalli Beach second as although it is not completely central, it is still close to other vibrant areas such as Haeundae Beach, Kyungsung Uni Area and Shinsegae Dept Store. Need help deciding where to stay in Gwangalli Beach? Below is a list of accommodation which I believe is best suited for all kind of travelers. The Nampo-dong area has many advantages as this area has quite a lot going for it and it comes as no surprise that it is arguably the #1 tour attraction in Busan. Nampo-dong is famous for its street food, wide variety of shopping stores from high-end brands to local discounts to loads of imported goods. If you wanting to get a birds-eye view of Busan, Busan Tower is also located here (Yongdusan Park – Picture on the left). Right next to Nampo-dong is Jagalchi Fish Market which is one of the best in Korea and certainly Busan. It is easily walkable and depending on where in Nampo-dong you stay, it shouldn’t take you more than 5 minutes to walk there. If you are looking to eat fresh seafood or constantly snack on Korea’s best street food, this is the area you should seriously consider 🙂 Nampo-dong is also only 2 stops away from Busan Station which is a plus if you intend to catch the KTX to other places in Korea. As Nampo-dong is located towards the south on subway Line 1, it is therefore a little bit further from other key areas such as Gwangalli and Haeundae. Also, you will have to switch onto subway Line 2 as well to reach those 2 beaches. although it is on the same subway Line (1) as PNU (Busan Uni) and Beomeosa Temple, it is still a decent trip out to there. Some of Busan’s best street food. A good range of shopping available at your doorstep. Within walking distance to Jagalchi Fish Market. Close to Busan Station for quick Departure/Arrival via KTX. If you are not big on seafood markets or eating seafood, I would probably stay elsewhere. My thoughts: Nampo-dong is a great spot in Busan and I would definitely consider staying here no matter your taste. If you are in a rush and want to see Taejongdae, Jagalchi and Nampo-dong itself, this is a good choice. If you are not so much into the nightlife, then I would perhaps choose Nampo-dong over Gwangalli and you may want to shop into the evening. To be honest you can’t really go wrong staying in the Nampo-dong area as it has so much to offer. Need help deciding where to stay in Nampo-dong? Below is a list of accommodation which I believe is best suited for all kind of travelers. Hopefully the information and advice above pushes you in the right direction to help make your stay in Busan more convenient and enjoyable. Please feel free to leave a comment if you have stayed in an area not mentioned above that you would recommend and I’ll try to add it to the list. This is such an informative post! Definitely a must read before visiting Busan. The city itself is a bit spread out, so this is a very helpful guide to finding the best area for you to stay. Hello! Thanks for the informative post!! We are heading there next weekend and were super confused on where to stay. This is super helpful! At the moment, we are trying to decide on Hotel Almond or Sunset Business Hotel. Any thoughts on Hotel Almond? Does not seem to fit into the neighborhoods you spelled out but very close to Nampo-dong. Hi Jaclyn, both Hotel Almond and the Sunset Business Hotel are good options. Hotel Almond is very close to Busan Station which is still a fairly good location and it’s only a few stops from Seomyeon which is a plus. Which ever you feel is the better Hotel I would book. How many nights are you planning on staying in Busan? (Hotel Almond is very convenient is you are arriving/departing via KTX). Hi KB, glad my post could be of some assistance 🙂 I just checked the Sky Island Guesthouse out after you mentioned it. Location, price and reviews look good. Being near Nampo-dong, Jagalchi and Taejongdae is great. Also, you will be fairly close to Busan Station which is convenient if you end up catching the KTX from/to Seoul. You should be able to see the Autumn colours which will be nice 🙂 Make sure you to visit places like Haedong Yunggungsa Temple and Beomeosa Temple as the leaves will be great that time of year. If you have any other questions please feel free to ask. Also, remember to try Dwaeji Gukbap 돼지국밥 as it is a Busan specialty (Pork Soup with Rice). Thank you very much for your quick response! I am currently prowling on your website for more information 😀 Also noting your recommendations in our itinerary! Your information is very helpful. Can I ask which is more budget friendly for using the metro and buses? The top up ard or unlimited one day pass? I guess it depends how long you will be in Busan? If it is just 1 or 2 days, I would get a day-pass. If you are going to be there for a week, I would get a top-up card. Some helpful info on Public Transport Cards. in this case if i stay around Haeundae or Seomyeon ,how do i go to airport ? as i read airport bus only will start around 7 or 8am ? If you are going in a group, you may want to consider a taxi (for convenience). Not that expensive in Busan. Some helpful info: 해운대기점 is the stop you can catch Bus 307. 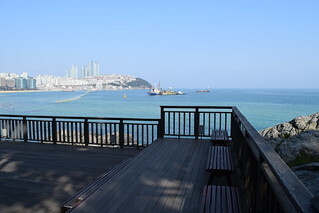 It is located just near Exit 1 at Haeundae Station. If you are feeling nervous about it, just ask the hotel/guesthouse/hostel to double check the time of the bus for you. really appreciate your help ^^ my flight 7.30am ,if 5am start ,i saw from your link it will take 1hr + to reach ,do you think i will be able to catch it ? you mention that taxi is not that expensive in busan,do you know around how much will it cost from Haeundae / Seomyeon to gimhae airport ? seomyeon is nearer to airport right ? Hi Yuri, I think you will have enough time. If you arrive at about 6.15, still some time to check-in. If you take a taxi from Haeundae, it will cost about 30,000 – 40,000 won (about 35 SGD) I would think, depending on traffic. haha not a problem. As you mentioned you are staying for 3 nights, it might save you some travel time staying in Seomyeon (plus Seomyeon has a lot to offer). Loads of restuarants, shopping etc. It’s a lot easier to travel to places around Busan from Seomyeon, as the train station connects with a few different lines and is centrally located. Yep, Seomyeon is closer to the airport. i wanna experience staying beside sea side so i guess maybe first 2 days stay Haeundae,last day shift to Best Western UL Hotel?! Since you would like to stay near the beach, have you considered Gwangalli Beach? I prefer it over Haeundae (still love Haeundae btw) but definitely worth considering. Then again it really comes down to personal choice. The Best Western UL Hotel is a decent choice for Seomyeon. Personally I would rather just stay 3 nights in the one place (where ever you choose). Gwangalli is almost in the middle of those two places (it is about 5 train stops closer to Seomyeon than Haeundae) and is close to the Kyungsung University Area (which is a great spot for eating and drinking at night). Gwangan Bridge at night is a great view which is a big plus. Have you looked at White Island Bed & Breakfast? Location is very close to Gwangan Station, $70 SGD p/night for a private room or $27 SGD p/night for a bed in a dormitory (I included both options as not sure what you’re looking for). It has good reviews on both Tripadvisor and Booking.com. There are a few others around a similar price. hmmm… it has a tripadivsor review on the 29 November 2015 and an Expedia review on the 11 Feb 2016. Have you looked at Guesthouse Mate? this is quite popular. Mango Hotel and Bexco Hotel B&B have availability as well. Maybe check those out. Thanks! This post was very helpful. I’ll be in Busan in July and I’m deciding between Seomyeon and Gwangalli but can’t make the final decision. I’m not into shopping nor I like to go to bars. I like beaches but we have 4 of them in my city so living by the beach is not as tempting. I’d prefer an area with lot of convenience stores and local restaurants or/and night markets. Based on your preferences, I would probably choose Seomyeon or Nampo-dong. Nampo-dong is close to Gukje Market which is quite popular and I enjoyed it when I went. Jagalchi Fish Market is very close as well. Seomyeon has loads of restaurants and has a good atmosphere. Seomyeon is slightly more convenient for sightseeing but not by much. to get to the beach,i need to take to 광안역 right? Yep, thats the correct station. 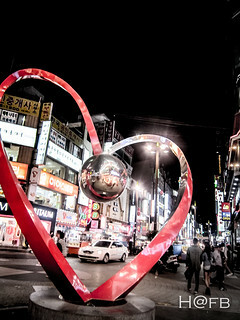 So 3 stops away is Kyungsung University Area (Good place for eating and drinking) and Centum City (Shinsegae Dept Store). 6 stops away is Haeundae Beach. 10 stops to Seomyeon. By the way, Bexco Hotel B&B is really close to Millennium Hoetjip (밀레니엄횟집), which is where you can buy fresh seafood and then take it to a small orange tent to have it cooked up for you. Pictures can be seen from my Gwangalli post and I have put a map below to help you with directions. yeah,thanks for your help,now i can start my Itinerary planning from getting information from your blog ^^,can tourist go in Kyungsung University Area ? oh ya ,will they overcharge foreigner if buying seafood from there ? i wanna try to eat in those small orange tent but i am alone.can Solo Traveler eat in those small orange tent ? If you want to buy fresh seafood from Millennium Hoetjip (밀레니엄횟집), when you order just stand as close as you can to the older lady when she is cutting it up. They are more likely to give you less than actually over charge. It shouldn’t be too expensive, so don’t worry too much. Eating alone is fine, I haven’t had any issues or bad experiences before, so don’t be shy. Hi. I am currently looking to stay i Nampo area and had identified Boutique Hotel YTT Nampo. What’s thought?. I have 3 adults and a 11 year old child travelling to Busan. Boutique Hotel YTT Nampo has good reviews on booking.com and fairly good reviews on Tripadvisor. Its only 400 metres from Nampo-dong Station as well. You will be close to a lot of popular sites including Jagalchi Fish Market, Taejongdae, Gamcheon Cultural Village, Nampo-dong (of coarse) and not too far away from Busan Station and the Seomyeon area. Hi. Just read in one of the hotel review in which it mention that is was a formerly a “love hotel”. You have an idea ?. Concern is a love hotel now. I have a children travelling so a bit concern now. I didn’t seem to see that review. I would think it is fine as the many reviews from other guests (I checked Agoda as well) seem good. If you think that is going to bother you that it possibly was a former love hotel, I would simply book somewhere else (I have given a few hotel recommendations in the Nampo-dong section of this post you can look at). Hi there. We (5 adults) will be traveling to Busan this coming 24 to 29 June 2016. It’s 6D5N free and easy. Because it’s a last minute decision to visit Busan ( we booked our flights 2 days ago), we have not any plan as to where to stay and what to do and which places to visit. Our plan is to visit as many of those must see places, eat those must try foods and of course do some shopping. Would be great if u could give us some ideas as to how to kick start our holidays. Thanking you in advance. As you have 5 nights, you may want to split your stay into 2 areas or if you are happy to stay in just 1 area that is also fine. Also, you can pretty much stay where ever you like (lots of time to see the major sites). 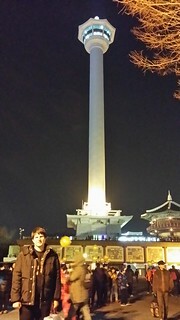 I would recommend Nampo-dong, Seomyeon or Gwangalli, as these areas are most centrally located. I would suggest you take a look at my 3 Day itinerary and spread it out over 6 days. If you haven’t been to Gyeongju before (Gyeongju was the capital of the ancient kingdom of Silla – a lot of great temples here), I would suggest doing a day trip from Busan on one of your days. + Shinsegae – A lot of shopping, Jjim jil bang (spas, saunas and massages) and a cinema. + Taejongdae – Take your time (maybe go to one of the many clam tents near the entrance after you are finished here). 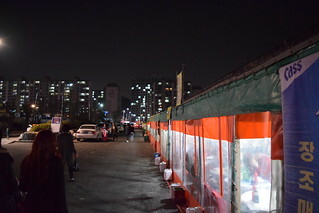 + PNU – The area around Busan University at night is pretty good and buzzing with people. Lots of restaurants. + Gamcheon – Spend a bit longer here. + Gijang Shijang – At Busan Crab Market, you may want to sit down and eat crab here (you can take your time and really enjoy it). I hope that gives you some ideas and points you in the right direction. Hi Mark, so glad to hear from you. Thank you so much for your suggestions and recommendations. 4 of us, husbands and wives are in our fifties and a daughter in her twenties. Yes, we intend to spend 2/3 nights in the city and 2/3 nights near the beach. We were thinking of Nampo-dong area and Gwangalli beach. We would love to cover Gyeongju as well since there are 2 Unesco World Heritage site there. Do we need to arrange/book ahead, Entrance tickets/Train tickets (where applicable)? Can we use ATM card to withdraw cash at ATM machine (if yes, are they easily available everywhere) or do we need to carry enough KRW? Hi Kuenie, not a problem. I have included those other places below. Day 5 – Gyeongju Day Trip (you can buy bus tickets to Gyeongju from Busan Central Bus Terminal, which is next to Nopodong Subway station – one more stop after Beomeosa Temple). You don’t need to book ahead (can buy everything on the day). I didn’t have any problems withdrawing cash from an ATM (always a good idea to keep a little bit of cash on you). Citibank is always a good bank to withdraw from (normally works fine). Please note, your Day 1 contains quite a few places, but since most of them are all in the Nampo-dong area you should be fine (make an early start). Enjoy your trip. I’m sure you will. Gwangalli Beach is a great place to go for a night out (restaurants/bars overlooking the water and famous Gwangan Bridge). It is also fairly well located to other sights. As it is Winter, I highly doubt you will be swimming or sun bathing as such so I would probably choose Seomyeon as it is very well located and allows easy access to almost all the sites in Busan (mainly because it is on Line 1 and Line 2 of the Subway). Not only that, Seomyeon has an abundance of restaurants, bars and shopping (make sure you do the underground shopping area which is located essentially at Seomyeon Station). If you are set on Gwangalli that is also OK, as it is also a great place to stay. I’m going on end nov, my friend is keen to see sun rise and i like sea view in busan accomodation. Had originally plan to stay hotel foret busan station but now im trying to figure out best place to stay. Sounds like maybe somewhere like Gwangalli Beach would suit. Beach view + can see the sunrise any morning by a short walk. 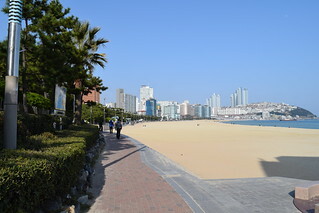 Haeundae beach, Shinsegae Dept Store and Jyungsung Uni Area are very close. So is Seomyeon. You would have to change trains at Seomyeon to get to Nampodong/Jagalchi/Beomeosa but that isn’t a big deal. Thanks for this list! 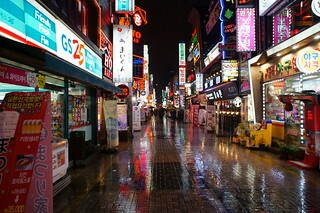 Will be staying in Hongdae the first night and in the Gwangali beach area the 2nd and 3rd night. Will share on my social media. This post is super informative, thank you! I will be in Busan for 10 days, this September, taking the KTX from Seoul. My main reason for being in Busan is to watch the Women’s Baseball World Championships at Gijang Hyundai motors Dream Ball park. What mode of transportation would you recommend on getting there? I was thinking of staying in a more central location to see temples in between watching the ball games. From some research it looks like public transportation doesn’t reach out there. In terms of where to stay, I had a quick look at what is the least painful in terms of travel time to and from the stadium. I would suggest staying near Haeundae Beach (closer to Jangsan Station 장산역) and just catching bus 182 to Gijang Hyundai Motors Dream Park (as shown in Google Maps below), that way you are still in reach of everything Busan has to offer (rather than just staying out in Gijang for 10 nights) and you only need to catch 1 bus to get there. The bus ride seems to be about a hour and 20 minutes. Also while catching bus 182, if you get off at the bus stop Gijang Shijang (기장시장), you can eat some fantastic seafood there, especially crab. If you’re interested you can see more on my Gijang Crab Market post. I’m so glad I found this blog! Quick question – I’m heading to Busan on 25th October (arriving at noon) to 30th October (flight departing at noon). Will probably stay in Seomyeon all the way. Don’t mind to travel via subway. Can you kindly recommend a 4.5 days suggestion list on sightseeing and what to do/eat (local food)? Also, should I get an unlimited pass (2 pax travelling) for subway rides? I would suggest doing this 3 Day / 2 night itinerary + Songdo Beach. As you have 5 nights in Busan, I would highly recommend taking a day trip to Gyeongju (A lot of historical sights located here eg: Anapji Pond, Bulguksa Temple, Seokguram Grotto and Daereungwon Tomb Complex). You could spend 1 night there if you feel like you needed more time sightseeing. If you still find yourself with a lot of time, you could go to Seokbulsa Temple. The unlimited pass seems like a good idea (I believe it is only 4500 won per day), so that would make sense. You are the best! Thank you!! No worries Rachelle, glad I could help. This post is awesome! glad to have found this 🙂 My family and I, will be visiting Busan for 2 days then we’ll be transferring to Daegu then to Seoul..I think Seomyeon is the best location for our short stay in Busan. Can you suggest one restaurant in the Seomyeon area that serves the best fish cakes 🙂 ? I was recently watching this Korean Series of the three triplets Daehan, Mingkuk & Manse and one of the episodes featured their breakfast eating delicious fish cakes in busan (yum yum).. We would really love to try one of these authentic cakes before we leave.. These can be found pretty much everywhere on the street at night. 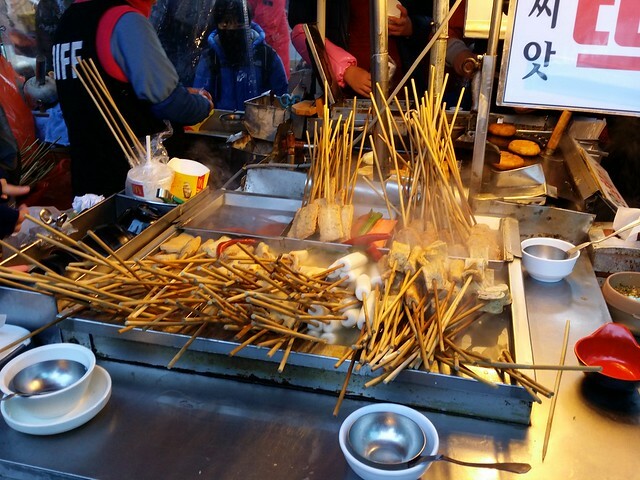 I was in Seomyeon a couple of nights ago and there was heaps of Fish Cakes available at most street stalls. If you do want to eat it in a restaurant, you will need to look for a dish called Odeng Tang (오뎅탕). Simply order Odeng Tang (오뎅탕). Please note these restaurants normally open in the evening so probably sometime after 6pm would be recommended. Really thankful for ur blog. Going to Busan (27-31Dec). Shd b real cold then. I have 4 adults(including a preggy lady), 1 teenager and 2 kids. Wont be rushing but intending to enjoy the time theredue yo the mixed group. Taking up ur 3d2n itinerary. Winter is a good time to visit as there are usually less crowds ( although it is a bit cold – just make sure to wear some warm clothes and you will be OK 🙂 ). It also rains a lot less in Winter in Korea so your days should be pretty good (little bit chilly but OK). Nampodong normally have some XMAS decorations so be sure to take a look (some statues will lights etc, worth a look). I hope you enjoy your trip. Thank for such a beautiful and informative write-up! Would like to ask for your advice ask my friend and I (age 21) will be travelling to Korea from 4-20Jan ’17. We intend to spend 1 night in Seoul on 4Jan and depart the next morning on 5Jan to Jeonju and will be there from 5-7Jan. We will then head to Busan on 7Jan and spend 5D4N there. We were thinking of staying in an accommodation in Nampo-dong area since it seems to be more accessible to the places which we intend to visit. Should we give up visiting the beach since it would be winter when we visit? Or which between the 2 beaches would you recommend? Also, would you have any guesthouses to recommend apart from those listed above? Additionally, would you recommend us to shorten our Busan visit to spending 3 nights there instead? After Busan, we would then head back to Seoul and will be there from 11-20Jan. Sorry for the trouble and thanking you in advance. Winter in Korea is cold however mostly dry therefore taking a trip to one of the beaches like Haeundae is definitely worth it. My post on Haeundae was done in the winter so all the photos are most likely what you will get. 2 beaches would be Haeundae Beach (during the day) and Gwangalli Beach (at night to see the bridge lit up between 8pm-10pm). I would recommend getting dinner in Gwangalli one night overlooking the beach (its a nice view). Hotel Noah is in a really good location in Nampodong. It is right across the road from the main food street in Nampodong and also very close to Jagalchi. 3 minute walk to both Nampodong and Jagalchi train stations. Since you have so much time in Korea I think 5D4N is perfect. There is enough things to do in Busan to keep you busy for those 5 days. If you feel there isn’t, you could always take a day trip or overnight trip to Gyeongju. Hi, thank you for your detailed post. I’m currently deciding on my accommodation for 3 nights in Busan during the Lunar New Year. It will be with my parents, and they do not want to stay at hostels. I’m considering on home hotel, and found reviews that it is a love hotel. May I check if it’s true? And for best western UL busan, is the walking distance from the Seomyeon station manageable with luggage? Walking with luggage from Seomyeon Station is manageable. You can see on google maps it isn’t that far. Home Hotel, Best Western UL, Ibis Ambassador Busan and Angel Hotel are popular choices. Angel Hotel is in a very convenient location and has great reviews. Home Hotel is not a love hotel. Hi, I have came across your blog while searching for busan, and your site has the most intensive information about busan, almost like a one stop centre. Thanks. I’m travelling with my parents in the 50s, and will be in busan for 3 nights during the Lunar New Year period 28/01/17 – 31/01/17. i’m still comtemplating if to travel out to seokbula temple, beomeosa temple, or even Bulguksa Temple in gyeongju. I’m also undecided on where to stay. We don’t club or drink, and my parents don’t do shopping. Reason to stay in seomyeon will be for easy access to subway, but that’s about it. The hotels that i’m considering is the Home Hotel, and Best Western UL Busan. Another area is the Nampo area, and the hotels i’m considering is the GNB Hotel and Aventree Hotel Busan. I’ve read up on GNB Hotel, and i’m more keen to book that as the price is more competitive and the hotel is also newer. But is the walking distance to the subway manageable? Glad you find my blog helpful. Seokbulsa is probably too troublesome for your parents (unless they like hiking) as to get here is about a 4km round trip once you arrive at the top (after catching the cable car). Beomeosa is fairly convenient especially if you stay in Seomyeon (just catch line 1 and get off at Beomeosa Station). Bulguksa Temple is easily a day trip and with your limited time I would suggest spending your time on sights in Busan (rather then spending 2 hours on a bus there and 2 hours on the way back). Your itinerary seems good. I would definitely visit Gwangalli Beach at night. Seomyeon is convenient for travelling so that is probably a good choice (its located in the middle of both Nampodong and Haeundae so that is ideal as your itinerary is exactly that). If you do stay in Nampodong, Hotel Noah is very conveniently located and also the Aventree Hotel is quite good as you mentioned. Subway to Nampodong: Gimhae Airport Station to Sasang (change to Line 2 towards Seomyeon Station), Change at Seomyeon Station towards Nampodong or Jagalchi Station (which ever is closest to the hotel you book) Korean Link. If you are unsure about the shuttle bus simply ask the driver or the information desk (who speak English). I hope that information answers all you questions 🙂 I’m sure you will enjoy your trip. Hi Mark, thank you for your detailed reply. My main itinerary for the whole korea trip is Jeju, Busan, and Seoul. I was not aware that Korea celebrates the Seollal and have already booked my plane tickets to korea. Would it be better for me to spend the actual lunar new year (27/01/17 – 31/01/17) in Busan or Jeju? Will the attractions and shops be opened? I don’t think it matters too much where you spend Seollal (like Chuseok, a lot of Koreans go to visit their family to pay their respects to those who have passed). A few restaurants/shopping places may be closed on the 28th Jan but the other days they should be definitely be open. Most (if not all) of the attractions should be open (info here: Taejongdae, Yonggungsa Temple and Busan Tower are all open). So I would plan to visit Taejongdae and Busan Tower on the 28th (that way the other days you know for sure the shopping centers will be open. Hi! This is a very great and detailed post! ( I have not yet finish reading, tbh). Me and my friends are bound to Seoul, South Korea on 24 March until 02 April. We planned on staying in Busan for the first five days of our trip. Our first option is to take the AREX from Incheon to Seoul, then Korail to Busan. I am currently looking for accommodation near Busan Train Station so that it’ll be easier for us. Do you have any recommendations? I am considering getting one via AirBnB. Could you please help me produce a 5-day itinerary? 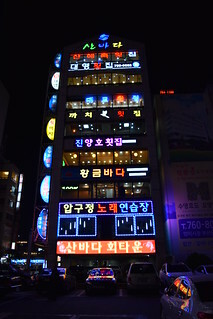 We prefer to jut stay in one hostel/hotel for our Busan trip but we hope to visit as many places as possible 🙂 I might definitely follow this entry of yours (http://boundforbusan.com/2015/11/busan-travel-itinerary.html). I would do the 3 Day / 2 Night itinerary I suggested, plus add on Songdo Beach and if you like a small hike, Seokbulsa Temple (includes a small cable car ride). I would potentially look at doing a day trip to Gyeongju (if you haven’t been there before) as there is a lot of historical sites there. This can be done visa bus from Nopo Station on Subway Line 1. Also, you may want to take your time at some of the sights as you have 5 days. If you do the Igidae coastal walk, you might want to visit the Oryukdo Skywalk while you are there. Some other advice would be to eat dinner at Jagalchi Fish Market. 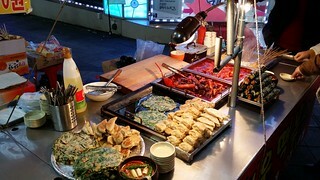 Some foods to try would be: (산꼼장어) Seasoned Grilled Hagfish, (산낙지) Raw Octopus, (파전) Korean Pancake, (전어구이) Grilled Gizzard Shad. Also while in Busan you should eat: (돼지국밥) Pork Rice Soup and (밀면) Noodles in meat broth (similar to Naengmyeon). Yay! Thanks for the notice and assistance! One more thing if not a bother. I’m a little confuse about using the korail pass. Upon seeing the website (http://www.letskorail.com/ebizbf/EbizBfKrPassFaq.do?idx=4#hidpos4), I’m a little confuse if I buy the 5-day use pass, will I’ll be able to use the same ticket for using the trains in busan or do we need to buy a designated train card for busan trains? Also, I have a T-money card I’ve bought and used last 2014, can I also use this for the ktx or trains in busan? You can use your t-money card in Busan. To recharge it just look for the T-Money logo at convenient stores like CU, 7/11 etc. What are you planning to use the Korail pass for? I don’t think you can use it on public transport. Hello, I will be visiting Busan during New years day. What special events will there be on new year’s eve and new year day? sorry! i couldn’t find my previous post so i asked the question again. But i found it after all >< sorry for double asking! Go to Busan Tower for New Years Eve, they let off balloons, have fireworks and have a small ceremony ringing a bell. Thank you for sharing the informations about Busan. I think the best option is taking a city bus tour like the following: here as it would be comfortable and convenient for your mum. Taking taxi’s is another alternative however if you think your mum is able to use public transport then of coarse that is an option. Please keep in mind the bus drivers in Busan are quite rough which means if you don’t get a seat (sometimes you do sometimes you don’t) it would be difficult for your mum. Taxi’s in Korea are quite cheap in comparison with other countries. As you have 9 people in your group, you would have to catch a few taxi’s which may be inconvenient. I would definitely recommend having the Korean names of the places you want to visit printed out if you do catch taxis within Busan (that way you can show the taxi driver – otherwise it may be quite difficult to communicate). I would do this itinierary and take your time. The Gamcheon Cultural Village has a lot of steps so I wouldn’t advise going there with your mum. Most other places should be fine. I am going to seol and Busan in mid December and was trying my luck to search for “Best place to Stay in Busan” and found your blog. Since this is the first time I am going to Busan, I will stay in Seomyen. Will follow your itinerary on the 3 days 2 night to others. I do not need to go Google for more information, this is such a great blog. Thanks for sharing. Thanks Janet 🙂 Glad my post help. Thanks for such a superbly helpful blog. Would be grateful if you could advise us (me and my wife). This is our first trip to Busan and we plan to spend 9 nights in Busan (Dec 5-13). Our main interests are food/shopping/sightseeing (not temples though). We plan to stay in Seomyeon area. Mode of travel in Busan: mostly subway, bus, taxi (if necessary). Most of the posts here are for considerably shorter duration of stay in Busan so we would be grateful for your suggestion for a 9-night itinerary. Do you plan on visiting Seoul? Once you reply I can give you more of a detailed response. ii) if I could do some fishing at a pier/jetty? Fishing in Korean is called 낚시 (nak shi). I have seen quite a few fishing shops around. Best bet would be to ask your hotel/hostel where the closest one is. A map of some tackle shops here in Busan. Somewhere to go fishing would be Songdo Beach. Thank you! The itinerary that you provided and suggested hotels already lessen my stress in helping them with their vacation. Thank you very much!! You can easily catch the subway (Busan Station > Seomyeon > Sasang > Gimhae Airport) or a limousine bus however if they are not confident travelers, I would recommend your parents getting a taxi from Busan station to the airport (about 30 minutes travel time and around 15,000 to 20,000 won depending on traffic). Hi! Bookmarked and love your blog! My family of four (including 2 kids aged 12 and 9) are travelling to Busan feom April 10 to 15. All our flights arriving and departing Busan are in the evening. This will be our first time ever in Korea. We wanted to see the cherry blossoms, go to Lotte Theme Parks and the beach. My mom also brought home these lovely small ceramic birds that you could blow into and whistle. I wanted to know where to buy similar items. Plus my husband and I would love to try Korean food as well. Reserved at Dawn Beach Hotel based on what I read from your blog and availability. I could cancel easily for free though. Given my particulars, may you kindly suggest the best place to stay during our time frame and may you suggest an itinerary for 5 days? Would you advise us taking the train to the hotel bringing 2 large luggages? We could also spread out to 4 cabin luggages. Not familiar with anything in going around Korea. And if taking the cab is better for 4 pax to and from the airport. The Dawn Beach Hotel is a great spot as it is right next to the waterfront. As you will have 5 days in Busan I think that location is fine (close to Haeundae Beach, a few stops from Seomyeon and still not too far away from everything). A taxi is easily the most convenient way to get from the airport to your hotel. If you catch the bus from the airport it is 6,000 won each (so it will be 24,000 won all up). A taxi will be about the same price, even cheaper. So I would recommend catching a taxi. For your convenience, here is the hotel name in Korean 돈비치관광호텔 and also the address in Korean 부산 수영구 광남로 96 . I would do the 3 day itinerary I recommended however taking your time and enjoying the things you like (do more shopping if you want or stay longer at the temples/beach etc). Songdo Beach is a nice place which has a nice boardwalk. For Korean food, you can get some ideas here and also a few restaurant recommendations here. Small ceramic birds/items I am not too sure about unfortunately. All the best to you and your endeavors. You truly help make visiting Busan easier for many tourists like myself 😊. Many thanks and kindest regards. Im planning to go to Busan on March and will plan to stay in Angel Hotel as you recomended. Im just worried how to get there the fastest, I arrive 10pm at the airport and would like to know if you recomend the limousine or the subway? but would still like to get your suggestion for me not to get lost on my first day in Busan. The fastest way would be a taxi and would likely cost somewhere between 10,000 to 18,000 won depending on traffic. The limousine is about 6,000 won (per/person) however takes slightly longer. If you are going with another person I would definitely recommend taking a taxi and the price would almost be the same. The subway is fine and is your cheapest option. Personally I would take the Limousine Bus or Taxi. hihi, your blog awesome, it provides great insights for first timers like me. I will be going to Busan from 25 March to 29 March. I like to see cherry blossom, but I doubt I am too early! Nevertheless, where do you recommend me to go? Dalmaji-gil road looks good to me or will you recommend jinhae-gu? Also, I intend to visit Busan University, Oryukdo island, Gamcheon Culture village and Haeundae Beach. In this case, will you recommend to stay at Haeundae or Seomyeon? Is there any food, places or things I shall buy, visit or eat during my times there? Seomyeon is the most centrally located area so it definitely makes your travel a lot more convenient. Some ideas on what to eat while in Korea, and a few restaurant recommendations. You should definitely try Pork Rice Soup (돼지국밥), Hagfish (꼼장어) and a noodle dish called (밀면). How to get there: Take metro line 2 to Jangsan Station, then take either bus #2 or #10. How to get there: Take metro line 1 to Dongnae Station and walk for about four minutes. How to get there: Take metro line 2 to Mt. Geumnyeon Station and leave by Exit #6, then walk for about 30 minutes. How to get there: Take metro line 2 to Mt. Geumnyeon Station and leave by Exit #5, then walk for about 10 minutes towards Gwangalli Beach. How to get there: Take metro line 2 to Mt. Geumnyeon Station and leave by Exit #5. Gwangalli Beach is roughly a 10 minute walk. I just wanted to say thank you for such an informative post. This really helps sort out the amount of info that I have been looking at regarding Busan. I also have a few thoughts on my mind for my upcoming trip (mid May). My wife and I (along with a baby) will be in Busan for 4 days, 3 nights. Initially, I had wanted to stay at Haeundae Beach, but after reading your review, I am considering Seomyeon at the moment. What is special about Seomyeon besides the fact that it is centrally located? Are the restaurants there good and is the location good when traveling with a baby? Also, do you have an idea of how long it takes to take a taxi from Haeundae to Seomyeon (and how costly) at night time? I have not been able to find this information on Googlemaps. Glad the post was helpful. 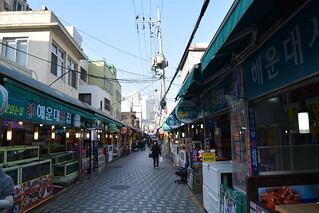 Seomyeon has a large number of restaurants, is centrally located (Access to both Subway Line 1 and Line 2) and has a lot of good shopping available as well. It makes traveling by subway a bit more convenient as you won’t really have to change lines at all. If you are wanting to stay near the beach while in Busan I would recommend Gwangalli Beach as the restaurants all face the waterfront over-looking Diamond Bridge (Gwangan Bridge). It’s also slightly closer to other popular attractions. Since you really love the beach, I would probably recommend staying in Gwangalli Beach or Haeundae Beach (they are both pretty close to Shinsegae Department Store as well). Hi, I am planning to go for trip at Busan in beginning of June with 3 adults & 7 yrs old girl. As you have 6 nights in Busan, I would suggest doing my 3 day itinerary and spreading it out a bit. Also, you can include Seokbulsa Temple if you feel like a hike. I would also recommend visiting Songdo Beach which is only 20 minutes by bus from Nampodong Station. If you find yourself with a lot of time, a day trip to Gyeongju is very doable and you may even want to spend a night there (if you dont want to rush things). Very historical/pretty place with some good food. As to where to eat in Busan, there are few recommendations here. Also you may want to look through some of the food I have eaten in Korea so far here. We’ll be in Busan for 5 nights in July and this information was super helpful. Thanks! We’re spending a week in Seoul and 2 nights in Jeonju so we want to stay by the beach in Busan. Regarding the difference between Gwangalli Beach or Haeundae Beach, are they both good for swimming? Does one have cleaner water than the other? I like the idea of Gwangalli because it is closer to the city, but my kids will want to swim in the beach and I was wondering if it would be as nice as Haeundae since it is closer to the city. Thanks for your help! Haeundae beach in summer is very busy so if your kids would like a bit of space when they swim, maybe Songdo Beach or Songjeong Beach may be slightly less crowded. In terms of the water quality between Haeundae Beach and Gwangalli Beach, literally the same to be honest. If you want to stay near the beach I would choose Gwangalli Beach. Awesome! Thanks so much for your help and suggestions! Hi, thank you for your post, it is indeed very useful for first timer like me. I am planning to go to Busan by end of June. Is it a suitable timing to go there? Will the weather be too hot during that time? Thank you for all the great info. I am currently living in Japan and will take the speedboat across from Fukuoka in June. I am a avid hiker so that is my main focus in Busan. There is a possibility that I may be traveling by myself. I will have 6 full days in Busan. I really want to see and do as much as possible. Hike and explore by day, and see the lights by night. Tips of what district would be best and hiking tips for a solo middleage female? I would suggest staying in Seomyeon as it is very conveniently located (Subway Lines 1 and 2) therefore it will make your travel time a lot shorter. Seokbulsa is a temple you may want to visit if you like hiking (you can catch the cable car up and then hike to the temple). Jungang Park provides a nice stroll/hike. If you are looking to meet other travelers, I would suggest going to some foreigner friendly bars like HQ bar or Beached Bar in Gwangalli Beach. Hi, thank you for this great and informative post. Better than any guide book I have come across to understand Busan, where to stay and what to do. Blog is also great, as it is very informative reading people’s questions and answers. I am thinking of staying 3 nights at the Ibis Ambassador Hotel in the city centre and 4 night at Citadines in Haeundae. What do you think? I have some points to use with Accor hotels (of which the Ibis is part of), but also thought the area may be nice to explore in the evening as I will be there early September from midweek, so Haeundae may be very quiet then. I would then move to Citadines at the week end, as I thought it would get busier around there and would not mind to relax an afternoon/ morning by beach. What do you think of this plan, the one day trips, the hotels and are my assumptions of staying in Haeundae at week ends true. Will it be busier and livlier then? I would certainly recommend a day trip such as Gyeongju. I would even suggest maybe just booking 1 night there as that will allow you to see everything. As for staying near the beach for part of the trip and the other half in the city center (near Seomyeon), I think that is a good idea and I have a friend who is doing exactly that when they come to visit me (as you are coming for 7 nights I would agree it is best to change scenery). Haeundae is busier on the weekends (you’re right). Have you considered staying in Gwangalli Beach (arguably better than Haeundae – ocean facing restuarants, cafes, Gwangan Bridge lights up every night at 8pm). You can see my post on Gwangalli here. I’ll take your advice and book at least a night in Gyeongju. I’d like to stay at Citadines. Looks very nice, has a kitchen and I loved it when I was in Tokyo, hence thinking of Haeundae, but I’ll have a look at Gwangalli. Thanks again your blog will be really useful for my trip. Thanks so much for this amazing post. We’re staying in Busan for 2 weeks (arriving on August 3, then going to Seoul for a week on August 8-14, then stayng in Busan again from 14 to 20). My nephew actually lives in Busan in Dongseo University. We think the best choice is Seomyeon for us, all things considered. Again, we both really appreciate it. You are welcome. Thats great you know someone here 🙂 Should make things a bit easier. I hope you enjoy your trip! If you had a chance to live a year in Busan, which neighborhood would you choose? I plan to go there for a Job a i gonna need to go in Yangsan each day…I looking for a good place to rent an apartment in Busan near from subway..
Yangsan is quite far from the main city part of Busan. The best areas would be Gwangalli, Seomyeon, Nampodong, Haeundae Beach or any other area that is close to Seomyeon by bus/Subway. As you said you would be working in Yangsan, it is better to find a place to rent closer to there otherwise you will have a long commute to work everyday. Let me know if you would like any other advice. Just wondering, a lot of your suggestions are hotels / motels. Is it possibly be because airBnB wasn’t as common previously? I have stayed at quite a few airBnB’s in Busan however have found better service with hotels/motels (in my experience), so have recommended those. I have friends who have stayed at airBnB’s in Busan and really enjoyed it, so it’s really up to the person what they prefer. I would first choose an area which you think is best (like Seomyeon, Gwangalli Beach etc) and then look for accommodation which is within your price range. Both areas are great to stay. I would choose Seomyeon as it is a bit more convenient in terms of location (Seomyeon is located on subway line 1 and 2 – therefore you won’t need to transfer at all). It’s closer to Gwangalli, Haeundae, Haedong Yonggungsa Temple and Beomeosa Temple. If you really want to stay in Nampodong, go ahead as there are still quite a few places down that way (Taejongdae, Gamcheon Cultural Village, Jagalchi Fish Market and Songdo Beach). You can catch the train (KTX – click here for the official site for booking tickets) from Incheon Airport to Busan and it take about 3 hours (I prefer it to flying). The last train seems to depart 8:38pm. 28 Oct: Haedong Yonggungsa Temple, Dalmaji Road (coffee shops/unique cafes), Haeundae Beach, Dongbaek Island, Gwangalli Beach at Night for the annual Busan Fireworks Festival. thank you for the prompt reply. 😊 ill catch the last trip of KTX back to Seoul (or maybe 2nd to the last). ….and thank you for the heads up re: Fireworks Festival!!!! 😍 am SUPER excited now! if i will make it 4D3N? what can you suggest on my last day? thank you once again for your generosity! Hi! This blog and all its Information inside are very helpful. Been in Seoul for more than 5times but never visit Busan. Will definitely visit Busan in my next trip. Staying near Busan Station is also fine if you are only staying for 1 night as it would be convenient to access the train station for KTX etc. However if you are staying for 2+ nights, somewhere like Seomyeon would be better as you can catch subway line 1 and subway line 2 without transferring saving travel time. Near Busan station is China Town, Russian restaurants and obviously some Korean restaurants however somewhere like Seomyeon would be a lot easier plus also a lot more vibrant. You could also opt to stay in Gwangalli which is about 10 stations east of Seomyeon however if you plan to visit places like Nampodong, Jagalchi, Taejongdae, Songdo Beach, Gamcheon, Beomeosa Temple and Busan University Area you will need to transfer through Seomyeon if you’re taking the subway (which is the most cost-efficient way). It’s probably worth thinking about what attractions you want to see and then decide what area is appropriate. Generally speaking Seomyeon is the most centrally located place and has the most restaurants/atmosphere in Busan. I definitely do recommend going to Gwangalli Beach at night for dinner and/or drinks. hi..this is very informative blog. i will be in Busan on early October. My flight will arrive around 8 am and i plan to take last Mugunghwa train to Seoul at night. May i know what time is the last train? Before leave to Busan, I plan to stroll along Busan. can u recommend me some place to visit. Thank you very much. You can see my recommended 1 Day itinerary here. Hi there, I just stumbled across your blog whilst trying to plan my itinerary for South Korea. Based on your post above, I don’t know what area to choose to stay in. I’m planning on heading to Busan for 2 nights once I land at Incheon. Hoping you can give me some advice on where to stay. I plan want to visit the fish market, eat lots of street food, shop a little, go to Gwangalli Beach to see the bridge light up. What area do you recommend would be best and most convenient to stay in? After Busan, I plan on heading to Gyeonju for 1 night and then off to Jeonju for 1 night and then head to Seoul for 5 nights before returning to Australia. Are there direct trains that I can catch to and from these locations? Thanks in advance! I recommend you stay in Seomyeon while in Busan as this allows you to easily reach Jagalchi Fish Market and Nampo-dong(Subway Line 1), Gwangalli Beach (via Subway Line 2), Go underground Shopping at Seomyeon Station and around Seomyeon (department Stores etc). It is also close to Busan Station (where you will arrive/depart via KTX – high speed train). There is a direct train from Incheon Airport to Busan Station (book online here). To get to Gyeongju, you can catch a bus from Nopo Station (end of Subway Line 1) to Gyeongju. Jeonju to Seoul can also be booked through the same KTX website. As for hotel recommendations in Gyeongju, I can suggest the following: Gyeongju Happy Village Syeobul and GG Hotel. There are buses from Gyeongju to Jeonju. They leave from the Gyeongju Intercity Bus Terminal and are 16,600 won. 3.3 hours. As to where to stay in Seoul, please check out my detailed post about Where to Stay in Seoul. Let me know if you need anymore help. Thank you so much for the your help, recommendations and links, your posts have also been very helpful! I’ll have a look at your post about Seoul. Hi there, I just found your blog on Busan and found it informative. I m going to Busan in early April. Planning to take a KTX from Incheon Airport to Busan. However, i read that there are limited KTX for this option. So I am planning to stay 1 night in Seoul before I go to Busan. My stay in Busan will either be 2D1N or 3D2N. I would like your advice on child friendly hotel for family with 2 young kids below 5 yrs old. I thought of Hotel Almond which is near to Busan Station but i might be planning to go Jeju which I am not sure if it is nearer to Gimhae airport than Seomyeon. Also, I noticed that the Best Western UL Hotel that you have recommended no longer exists. Would you mind to recommend Jeju trip too? Is 2D1N sufficient? I would stay at either the Ibis, Unistay or the Angel hotel if you are planning to stay in Seomyeon (you can catch the airport limousine (Bus) to and from the airport btw. Thanks for that I will fix the link for the Best Western. For Jeju, unfortunately I’m not too sure as to recommendations sorry. May I know how do I go to Seomyeon from Busan KTX station? Where is the bus-stop at Seomyeon where I can take the airport limo bus? If you look at the Busan subway map, you can see both Busan Station and Seomyeon are both on line 1 (orange line). It stops in front of the Lotte Hotel which is right by Seomyeon station. Add-on, would you suggest to take taxi or subway to Seomyeon? I may have 2 luggages with 2 young kids. Subway is very convenient and easy to use. If you feel a taxi is easier, catch one as they are still cheap. I will come from S’pore. I arrive on 16Mar at Incheon airport around 10am n will take an express train from airport to Seoul station follow by Busan within the same day. I arrive Busan station around 4pm+ on the same day n I don’t intend to do any planning on that day due to too much traveling on the road n my children will b tired. Plan to stay 2 solid days in Busan. Arrive 16Mar n leave 19Mar around noon time. Could u pls advise where are the places I MUST cover on these 2 days. I like mixture of shopping and sightseeing. I m not a beach person, not sure should I cover Haeundae Beach? Mayb you can share with me what so good about Haeundae Beach? Read a lot blogs n almost 99% travellers all covered Haeundae Beach. I plan to stay Busan Station Dino Hotel. Is this hotel convenient to travel around Busan? I hv 3 big luggage with me. From Busan back to Myeongdong (Hotel Skypark Myeongdong III), could u pls advise how to take the train? KTX train n where to get the train ticket n which train station to board the train. Yes when arriving by KTX you alight at Busan Station. See my 3 Nights/2 Days Busan Itinerary post here for what to do (Spend more time at places you enjoy). If you don’t like the beach then I would skip Haeundae Beach. 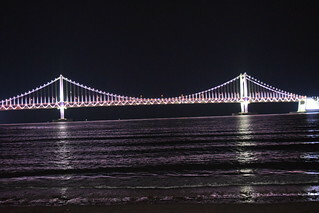 Gwangalli Beach has a better view with Gwangan Bridge lighting up at night. Staying around Busan Station is fairly convenient (I think Seomyeon is better as there are a lot more choices on food – but Busan Station is still OK). You can purchase your ticket from Busan Station to Seoul Station via KTX online here. Then simply catch the Seoul Subway to Myeongdong. Last question ~ what is the difference between AREX express train and KIX train. Thanks again for your help n your advice is a big help to me. With a simple google I found this information about the AREX train (it is the train from Incheon Airport to Seoul Station). I’m not sure what the KIX train is? If you meant KTX then this train normally travels to other cities around Korea like Busan, Daejeon, Daegu etc (inter-city train). I most likely will take AREX train to Seoul follow by KTX train from Seoul to Busan. May I know can I get both tickets at ICN airport? Can I just go to either one of the ticketing booth to buy the ticket or I hv to go to AREX counter to get AREX express ticket follow by KTX counter to get KTX ticket? When arrive Seoul station, do I need to transfer to any platform to take my KTX train? Again, you can simply book the tickets online. Hope that helps. I will land at ICN airport at 10.30am. Direct from ICN airport to Busan is perfect but I worry flight will delay then I will not be able to catch the 12.07pm direct express KTX train. That is also why I am exploring another option 2 to take from ICN – Seoul – Busan. For the second option, may I know can I get both tickets at ICN airport? Can I just go to either one of the ticketing booth to buy the ticket or I hv to go to AREX counter to get AREX express ticket follow by KTX counter to get KTX ticket? Need your advise on this pls. Buy your AREX ticket at Incheon Aiport (AREX counter) and then buy your KTX ticket at Seoul Station (KTX counter). I need your advise badly on this. If I m taking a bus from ICN airport to Busan, may I know should I take Cross~country bus or Luminous bus (standard or Deluxe). Which one will b more convenient ? I will b staying near Seomyeon area. I m thinking to take Cross~country bus n hv tried to google quite a fair bit on which Busan bus terminal to alight n near which KTX station but no luck, cant find more info. Can I get the bus ticket from ICN airport? If you hv other buses that depart directly from ICN airport to Busan, mayb u can share with me the details such as the link, bus schedule n which bus terminal to alight at Busan (possible advise near which KTX station). I use KTX station map to act as a guildline. Could u pls give me your advise. Thanks again. Sasang and Nopo bus terminals have easy access to Seomyeon via subway lines. So get off at one of those. I always use the KTX to get from Incheon airport to Busan so can’t help you on the bus routes unfortunately. Hi Mark. I hope you’re still available to answer queries for Busan-bound first time travellers, even as this post (remarkably loaded with tons of info and tips, thank you!) is more than two years old. 1. You did recommend the Haengdae and Gwanggalli beach areas for places to stay if you want a day or two with sea view. How is it that the SONGDO beach area isn’t in your list please? We were in fact, choosing between staying in Haengdae or in Songdo. Now I’m considering the Gwanggalli area too, thanks to your lead. 2. Would you personally recommend getting an AIRBNB accommodation in Busan please? We will be coming in from a long stay in Seoul via hotel accommodation and I was just thinking if getting airbnb for our Busan leg will be a good experience too. I am hoping you’re still up to give me valuable inputs on above concerns. Thank you for your patience and generosity. Bless you. Hi Isabel, the reason why Songado is not recommended is that it is quite far from ither attractions in Busan and is not on the subway line therefore is very far from tge main tourist sites (Gwangalli, Seomyeon, Haeundae etc). If you would like to stay near the beach, Gwangalli is probably the best choice as it provides a better view of the beach and is more centrally located. Hi! Thank you for the post! I just booked to 5 nights at Hotel Laon which is close to Songjeong beach. I think it’s a new hotel. I am a bit worried it’s too far away from attractions and we will spend too much time travelling? What do you think? Our plans are not set yet but we want to see the main attractions. I would have wanted to go closer to the city (I think?!) but Mum wants a sea view and our budget is a bit tight. Any advice would be great, thank you! Thanks for sharing all these! You have a great website! We’ll try Seomyeon area this time (previously tried Haeundae beach area). hi I had booked Busan business hotel based on your post. Originally i had booked for Ibis Budget Ambassador…. since it’s only pay upon arrival and free cancellation. I am holding on to both bookings and will make a decision nearer to date. Hi, I am planning to go for trip at Busan in beginning of May 2019 with my family(4 adults) . 9 days is quite a long time to spend in Busan so you might want to think about day trips to other places near by (like Gyeongju, Suncheon, Yeosu or Geojedo. Anyways when travelling in Busan, its best to see attractions close to each other to maximize your time. When my family visited they stayed in Seomyeon and then Gwangalli which I recommend you do as well. I have broken down the ares in this post. Day 1: Stay in Gwangalli (I can recommend the Kent Hotel) Dinner a long the beach front. Day 7: Beomeosa Temple, Busan University Area (Lunch), Jeonpo Area for Dinner (next to Seomyeon). I hope that gives you some base to start your planning. I have showed quite a few people around in Busan so this itinerary is pretty convenient. As there are 4 of you I would recommend getting taxi’s to places like Taejongdae and Haedong Yonggungsa Temple as it will be quicker and easier.